﻿ Chicago Hispanic Newspaper, Lawndale News, Hispanic Bilingual Newspapers, Su Noticiero Bilingue » Bring the Troops Home! April 20, 2019 6:03 am You are here:Home Commentary Bring the Troops Home! 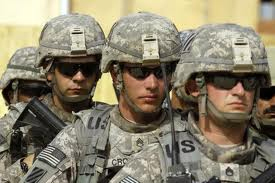 Posted by Editor on May 31, 2012 in Commentary | Comments Off on Bring the Troops Home! Even now, the U.S. military maintains 54,000 soldiers in Germany, 11,000 in Italy, and 9,000 in Great Britain. There are 39,000 American soldiers in Japan, and the United States maintains over 1,000 military bases around the world at a cost of $626 billion a year. This is not even including the military bases we have domestically. In the case of Europe, I have to ask why we have so many soldiers still stationed on that continent? U.S. military bases in Germany, Italy and Great Britain have been there since the end of World War II (1939-1945), and these bases were maintained and even expanded during the Cold War (1946-1991) when the United States engaged in a silent conflict against the former Soviet Union and its allies the Warsaw Pact. The Soviet Union is long gone, and the Warsaw Pact long gone before the Soviet Union dissolved. Yet the United States still maintains tens of thousands of troops in Europe, and the expense to the U.S. taxpayer is staggering. More to the point, there is no reason why these soldiers should be in Germany, Italy or Great Britain at this point. Russia is no military threat to western Europe, and in fact Germany and Italy have a brisk trade with Russia—especially for Russian oil and natural gas. No external power will attack Great Britain. The U.S. government is arguing that we have to maintain these bases and troop levels against international terrorism. But this logic simply does not work. Terrorist operatives can strike at about anywhere, and their targets are not always American soldiers or American bases more than civilian targets. The drain on the U.S. economy, especially at a time when we are suffering from a recession, is now making the idea of maintaining all or even half of these bases a dangerous liability. With America’s ballooning national debt, the U.S. government is going to have to eventually take all of our troops out of Europe. Although Japan, like South Korea, faces an imminent threat (North Korea), in my view it would make sense to withdraw most American troops from these two countries. In case few people have noticed, North Korea has been and is still developing rockets and intercontinental ballistic missiles to hit the United States and Japan directly. American troops will be of little use against missiles, and in fact may be extremely vulnerable to attack more than we realize. So in reality our troops in Japan may be of little use against North Korea—they are working on trying to strike the U.S. homeland. In this instance it would make more sense to prepare a defense against what North Korea is doing. But getting back to the troop levels we have in Europe, Asia and around the world. If the United States were to cut all or almost our troops, it would mean $2,857 in tax refunds for the average American family for every year. More than that, greatly lowering our troop levels would mean that the United States can work on preparing better defense systems against attack and making sure that we have the resources for more mobile rapid deployment forces—things not really possible with all of the money being spent to maintain the troop levels and bases we have now in places where the United States have no conflicts in. With the time coming when the United States and its allies will be eventually pulling out of Afghanistan, it would make even more sense to bring all of the troops home.